In 1953, French director Henri-Georges Clouzot brought The Wages of Fear to the silver screen. It was an edge-of-the seat thriller about unlucky truck drivers faced with hauling nitro-glycerine over near impossible mountain roads. Spintires is devoid of any such melodrama and presents a simple sandbox type game which mostly involves picking up wood in the most complicated and manly way possible. But it does offer tense moments and brings to the world of videogaming something entirely different; environmental truck orienteering. Did we say trucks? Specifically, large Soviet all-terrain vehicles. Most can be fitted with an interesting array of add-ons and trailers. Spintires' stand-out feature is the hugely impressive physics for each vehicle. Screenshots don't really do justice to a game where every wheel and shock can respond to every rock and mud wall. Tyre deformation is included too. It's impressive stuff. The other notable and possibly unique feature is the material-aware deformable terrain. We've seen such effects before, but here it's fundamental to how your vehicles move across the landscape. Thanks to the modern 3D marvel of geometry shaders, your wheels and chassis will plough through any wet surface material, leaving behind vehicle trapping ruts. Deformation is not just restricted to dirt materials. Water traps such as marshland, ponds and rivers will boil as you thrash your wheels trying to find some purchase against the muddy bottom. This is all technically-impressive stuff. Each rut or boulder will affect the balance of your vehicle. If you re carrying loose loads such as logs there's potential for everything to tip over, pulling you with it. And that, really, is the heart of Spintires: Mud Runner. It's not about being flashy, it's about making your way around sandbox maps and completing tasks that seem straightforward at first but, when faced with a hellhole of swampy, tire-sucking mire, become epic challenges. Mud Runner is billed as the ultimate version of Spintires, which was originally released on PC in 2014. It boasts a huge sandbox that links the game's five environments into one huge map, nine new maps dedicated to challenge mode, 13 new vehicles and a graphical overhaul. 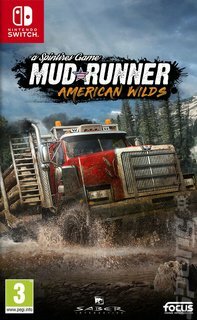 Add in all the previously released DLC and the new American Wilds expansion (which takes you through the rough lands of Montana and North Dakota and throws in iconic US vehicles from brands like Western Star, Hummer and Chevrolet) and you have a truly epic driving experience. Plenty to sink your tires into.